As rumors suggest Apple will launch a 12.9-inch iPad with a new stylus accessory later this year, a new patent application offers a glimpse at what the company could be working on, describing an advanced stylus that would offer much more dynamic ways of interacting with a touchscreen than just the press of a finger. The stylus concept was revealed in Apple's filing for "Expanded Function Touch Sensor Implement," published this week by the U.S. Patent and Trademark Office, and discovered by AppleInsider. The newly disclosed concept describes a stylus-type accessory with multiple sensors that would act in concert with a touchscreen device, like an iPad. In the filing, Apple notes that with current capacitive touchscreens, users can "mash" their fingertip against the screen, deforming it to contact a variable area of a touchscreen. A traditional stylus, meanwhile, does not offer as much precision, simply acting as a specific point where touch input is sensed. "As such, use of a stylus or other implement with a touch sensor may not be as flexible as use of a finger or other body part," the application reads. Apple's solution is to create an advanced stylus with a number of sensors to detect a variety of types of input. These could include the angle at which the stylus is touching the display, or the distance of the stylus from the device, potentially allowing for 3D input. 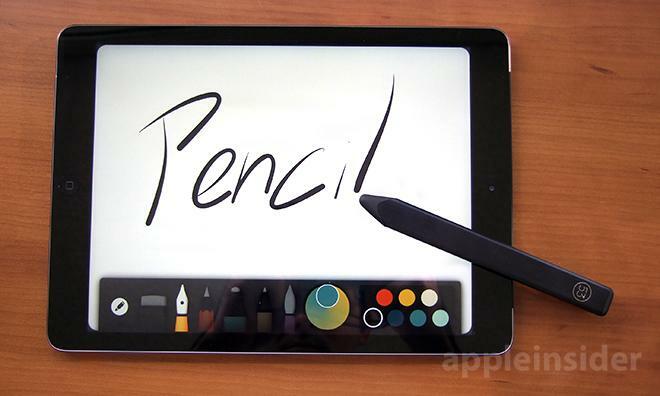 Those features sound similar to an advanced stylus described in earlier rumors, said to be in the works by Apple. Specifically, it was said that the company plans to release a stylus that would include a built-in gyroscope or accelerometer to allow new features like 3D handwriting. Apple's patent application also describes a stylus with a "grip sensor" that would sense the amount of force with which the user is gripping the instrument. The filing also describes a pressure sensor that would measure how hard the user is pressing the stylus against the device —something that could take advantage of Force Touch input rumored to be on future iPads. Another input method described by Apple is a "strain gauge" that would measure how much strain is being exerted on the stylus by the user. Finally, Apple also notes that its stylus could also include hardware buttons that could be pressed for alternative input methods. Development studio FiftyThree's iPad stylus is one of dozens already on the market. AppleInsider's own sources have indicated that the company is working on a 12.9-inch tablet, known colloquially as an "iPad Pro," that will feature a Bluetooth-connected stylus. Separately, analyst Ming-Chi Kuo of KGI Securities has said that Apple plans to launch the larger iPad with a simple stylus this year, while more advanced features such as 3D handwriting, are unlikely to arrive until next year at the earliest, with a new and more advanced stylus. This week's patent application is far from the first filing by Apple revealing the company's behind-the-scenes interest in developing a stylus. 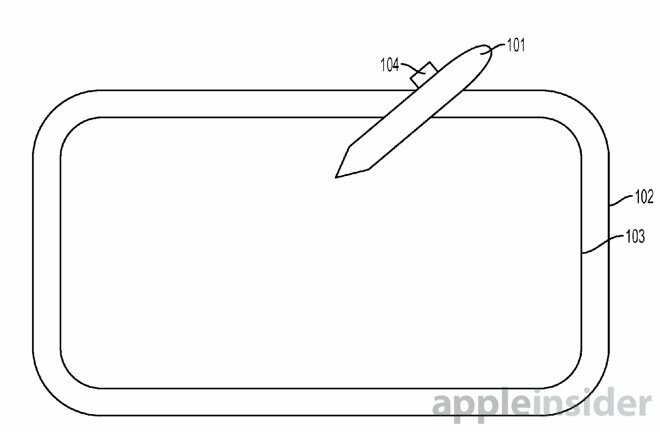 One concept detailed by AppleInsider last year included an extendable multitouch nib with onboard light and motion sensors, while another stylus patent published earlier this year described once again how a stylus can offer more precise input than a fingertip. Apple's latest patent filing was first submitted to the USPTO in November of 2013. It is credited to Christopher J. Herrick and Agustya R. Mehta.